Big News. Seriously Big News. We’re working on two different covers for this book: one for the paperback and one for the hardback. This is one of the concepts that Scott Bennett has been helping me out with. Still tweaking the outline of the tree and the boy in the foreground, but we’re getting there. When I started this whole Kickstarter thing three weeks ago, I was fairly confident I could raise the $3,500 I was trying to raise. Then you guys came along and shattered my expectations (in all the best ways) and we hit the initial goal in two days. You had me scrambling to come up with some stretch goals that would make the next 28 days exciting. 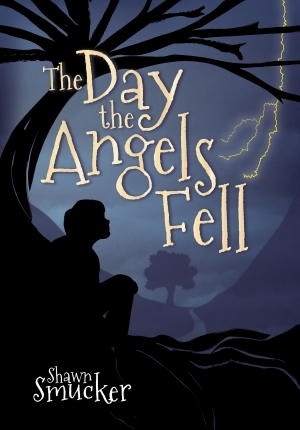 The Day the Angels Fell is hitting the road in April, 2015! But I need your help (again). We need places to go. We need you to introduce us to your book-loving friends. So here’s what I’m asking you to consider. 1) Anyone who contributes to the Kickstarter campaign at the $199 level (by Monday, November 17th) will automatically become a stop on our book tour. You get 10 free paperback copies of the book and one limited-edition hardcover – you can sell the books or give them away to your friends. We’ll come to you, anywhere in the lower 48 states and spend the evening with you and your friends talking about the book. I’ll do a reading, and it will be loads of fun (don’t worry, you don’t have to put me, Maile and the kids up for the night – we’ll find a hotel close by). 2) Maybe you don’t have $199 to spend on books. If you’d still like to be a stop on the book tour, and you think you can get at least ten people together at your house or a nearby coffee shop, then let me know and we’ll consider adding you to the tour. As most of you know, my family is always looking for an excuse to travel, and ever since our four-month, cross-country trip a few years ago, we’ve been itching to hit the road again. So we’re going to. And we’d love to stop in and say hello to you at some point on the journey. So, get over to Kickstarter and make your $199 donation to solidify your place on our book tour (we’ll arrange a date in April 2015 that works for you). Or send me an email at shawnsmucker(at)yahoo(dot)com if you think you’d like to organize a gathering of people to talk about the book. Thanks again for all of your support with this book. I can’t wait for you to read it. Congrats btw. This is so exciting! Nothing more required, MPT. We would love to stop at your place. Let’s talk about it soon. Shawn – I run an online literary journal (fancy term for a blog that makes it sound less bloggish) for a public library in Greenville, Ohio. Are you interested in doing an author event at the library and an interview for the blog? Email me and we’ll talk about it. Thanks, and good luck! I’m very interested, David. I’ll send you an email. Thanks. This is awesome! I’m so glad folks are rallying to keep this project going! Thanks, Ed! We’re really excited about it. You HAVE to come to Nashville. That’s not a request. Congrats, friend! Nashville is definitely on the itinerary. Thanks, Leigh! Shawn, this is so exciting! Congratulations! Thus far I’ve loved everything of yours that I’ve read. I’m sure Angels will be no different. We are ready to host the European Tour! You can start right here in England. It has been great to follow your story and read your posts. Congratulations.